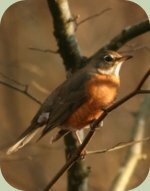 Identifying backyard birds is a great start towards becoming a proficient birder in any habitat. Its easy to put up a bird feeder and start observing the wild birds that stop by to eat. Time spent learning common species near your home will translate into a good baseline of knowledge to use towards identifying less common birds found deeper in the wilderness. To begin identify wild birds, a good field guide is a must have. Peterson's or Sibley's bird guides are an excellent choice. Both focus on emphasizing key characteristics for identification of wild birds and show birds in common positions. There are three main categories of observations that are core to identifying a bird: 1) Size and shape, 2) Field marks, and 3) Behaviors. Start with noting a bird's size. Think in terms of comparing the size in relation to birds you know. Is the bird chickadee-sized, robin-sized, or crow-sized? Next look at the shape of the bird. Does it have long legs, a short tail, is it slender? Noting size and shape is the first step to identify wild birds. Field marks provide the next layer of helpful information. Does the bird have eye-stripes, a rump patch, or a speckled breast? Is its beak sharp and curved, or narrow and straight? Are there bars on the wings? Field marks provide important clues towards the identification of wild birds. Behaviors provide the third layer of observations to help identify the bird. Is the bird climbing a tree or soaring high in the sky? Does the bird flick its tail as it moves about? Is it swimming or wading? All of these observations add up to give you a composite of the bird. These characteristics will then help you use a field guide to research and narrow down to the species you observed in the field. At first you might find you need to practice what to look for and become familiar with the variety of species in your region. With time, identifying backyard birds will become easier and faster as you grow your knowledge and experience. Students in the Alderleaf Wilderness Certification Program learn basic and advanced birding skills.